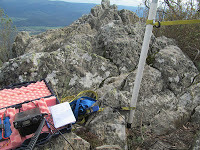 The weather forecast for Saturday was much better than last week so I had picked a couple of SOTA summits to activate. 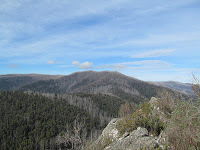 Pyramid Hill, in the Rubicon State Forest, is accessed from the Goulburn Valley Highway between Thornton and Eildon, by heading south on Snobs Creek Rd for about 16.5 km then turning right in to Number 5 Track for about 3.8 km until Royston Range Track. 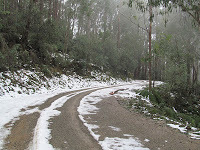 The roads are good condition forest roads that may be slippery when under snow. Royston Range Track is closed from mid June to early November each year. This isn’t a big deal as it’s only 1 km from the closure gate to the summit and about 60 m vertical rise taking about 20 minutes. The track in is easy to locate and passes beside the actual summit. 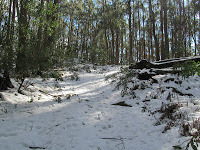 There was patchy snow at the start increasing to 15 – 30 cm cover at the summit. About 400 m in from the closure gate is a second gate where the main track heads to the left and the track to the summit is on the right. Sections of the track up were fully covered in snow and hiking in this is a new experience for me. I liken it to hiking in sand but with a little less movement underfoot. The snow was iced on top and the odd puddle along the way was frozen over. On arrival the summit was in low cloud but this cleared during the morning. I had decided to leave my squid pole in the car and use my 16 oz throw bag to place a rope in a tree. My first throw went exactly where I aimed about 10 metres off the ground. Unfortunately I had stepped off the end of the rope and the end that was supposed to stay on the ground was now in the air and the throw bag was on the ground. My second throw went slightly the wrong direction and got nicely tangled in a low branch about 5 metres up. It took quite a bit of effort on the line to get the bag free. This extended the antenna set up time by about 20 minutes. After retrieving the throw bag I went for a different branch, at about 8 metres up, and got the linked inverted-vee antenna set up without any more rope trouble. The antenna was not as high as I had first planned and one leg was tied off part way down the hill changing the angle of the wire and making it closer to vertical than horizontal but it was in the air and that’s always better than on the ground. I am normally quite particular about my coax cable, ensuring it has no loops, kinks or knots in it but, given the trouble I had had getting the antenna in the air, I left the three loops in the coax. Unsurprisingly it worked well as usual. Setting up on a nearby rock I was on air a little after 0000 z. My I first contact was summit to summit with Mark, VK3XL, who was activating unnamed summit VK3/VG-099. As I finished my QSO with Mark I announced I would be moving up 5 kHz. This meant the stations who were working Mark would also move up the band to find me ensuring a steady flow of chasers. 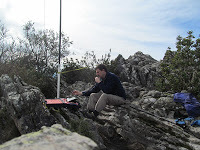 I worked 25 other QSOs including two QSOs on 24 MHz as part of the SOTA 12 m challenge. The first 22 QSOs came in 16 minutes. This is quite quick and resembles more like a DXpedeition or a contest rather than a lazy weekend activation. The chasers were well behaved and easily managed. Thank you! I finished up around 10:50 local and, after making a pathetic looking snowman, and taking some more photos, I headed back to the car to move to the second summit for the day. The weather had cleared and the cloud was gone. 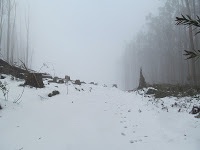 The temperature had risen a little and the snow on Number 5 Track was more patchy on the way down. On the way out along Snobs Creek Rd I passed Conn Gap Road which is the access to Mt Torbreck, VK3/VN-001 and noticed the tree that Allen mentioned earlier has been cleared away. One could easily activate both Pyramid Hill and Mt Torbreck on the same day. Pyramid Hill is the easier of the two to access. Sugarloaf Peak is located at the southern end of the Cathedral Range in the Cathedral Range State Park. The turn off to the State Park is well sign posted on the Maroondah Highway, about 4 km north of Buxton. 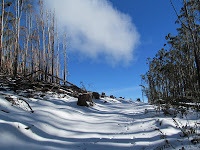 Sugarloaf Peak is best accessed from the Sugarloaf Saddle car park. The climb up from the car park, along Canyon Track, is listed in the Parks Victoria Park Note as hard and taking 30 minutes. The sign onsite says it is a 45 minute journey. It took me 60 minutes from car park to summit. 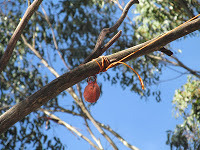 The ‘track’ is marked with orange triangles nailed to trees and glued to rocks. In one part the track is replaced with a steep climb up a rock face which, if you don’t like heights or lack suitable fitness, would be worth avoiding. 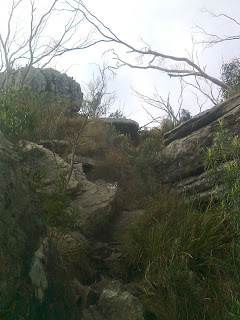 Other sections are steep ‘steps’ up rock ledges. There are risks along here, in particular with a heavy back pack on, that you may fall a considerable distance and sustain significant injury. If the rocks are wet then the risk increases. 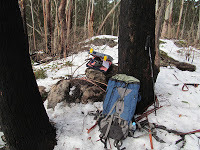 My pack weight was about 15 kg, a little on the heavy side, and next time I do this summit I’ll trim it down a lot. On the summit the choices of operating locations are slim. One can operate on the rocks, or on the rocks. There are a few small trees on the top and I was glad I had taken my 9 metre squid pole as it allowed the antenna to be at a very good height. I fastened the base of the pole to a couple of rocks, using two ratchet straps and tied the ends of the linked inverted-vee antenna to a couple of short trees. I got on air about 1:45 pm and worked Paul, VK5PAS and Ian, VK5CZ who were activating VK5/SE-007, New Campbell Hill. As I had done at Pyramid Hill I announced I was moving up the band a little and worked a steady stream of chasers in a very short time, 20 QSOs in 15 minutes. Again, the chasers were well behaved. Moving to 12 m got me four QSOs at a much more casual rate before heading back to 40 metres to get the last couple of chasers. The weather on the summit was pleasant with a bit of sun streaming through the light clouds.The view over the valleys to the hills in the distance was well worth the climb up. Many of the hills were burnt during the Black Saturday fires in 2009 and this is clearly visible with ridges of dead trees sticking up like pickets in a fence. 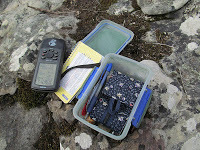 After packing away the station I moved north a little to find a geocache I knew was up there. For those not familiar with geocaching it involves hiding and/or finding hidden boxes using GPS coordinates published online. It is an activity I enjoyed for a few years before working portable in National Parks for the Keith Roget Memorial National Parks Award and then SOTA took me in a different direction. You can read more about geocaching it at www.geocaching.com. After replacing the geocache in its hiding place I headed back down the track to the car and off home. I climbed Sugarloaf yesterday with a light backpack & no radio gear – that was a big achievement, getting to the summit with a 15kg backpack and back down again! If one of my kids will help, I’ll try an activation (my daughter can carry the 12m Spiderbeam pole). Good to see another geocacher ham! There are plenty of us, it seems! Thanks Peter. Using this info to plan a activation. Nice to have worked you Summit to Summit. Enjoyed your blog & well done on the steep climb over the rocks. 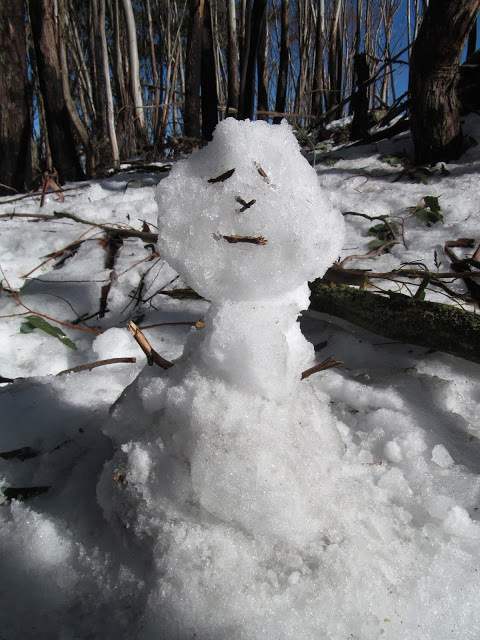 And yes as per Andrew’s comment, a great effort on the snowman. You never know he might still be there (or part of him) for the next activation by someone. Thanks enjoyed reading the blog. Cathedral Range has a few characteristics and similarities to some of the rocky mountains in the ACT. Great snowman!